We’ve never really had a grown up master bedroom. When you get married and combine your things, there’s always that awkward period of ‘how many of my husband’s things can disappear while still seeming fair”? Our last house didn’t have room for nightstands next to the bed. It was one of those awkward rooms where all the walls either have doors or windows and the only wall that didn’t was small – so, we used barstools. They worked for holding our lamps and keeping our cell phones up off the floor at night. Other than that… they were stools. When we moved to our new home, we were lucky enough to buy a home with a nice sized master suite! It’s about 15’ x 12’, and despite sprucing up almost every other room in the house, we hadn’t touched the master bedroom! I knew it had great potential to be anything I wanted it to be, but that was the hardest part… What did I want my master bedroom to be? In the meantime, my husband and I completely renovated my home office, and it quickly became my favorite room in the house. It was so bright and airy. My love for that space is what eventually helped me decide on a feeling for the master bedroom. It’s important to always establish the way you want a room to feel. This is different than a design style. While my living room is rustic contemporary, it feels cozy and warm and inviting. I wanted my master bedroom to feel serene and relaxing. I chose a palette of pale blues, grays, and whites with a few darker pops for some visual interest. Here’s what we started out with. We bought the darker drapes from Target during the first week of living in our home for privacy having no idea how we were going to decorate the space. I purchased the white curtains (in the after photos) from Wayfair.com about a month ago. And here’s what we ended up with after our renovation! I went with a pale blue paint color from Clark + Kensington (from Ace Hardware) called Mirror Image on most of the walls except the headboard wall! Check out this step-by-step tutorial on how to create your own wood paneled wall. We painted that Benjamin Moore Cloud White. NIGHTSTANDS & DRESSER: I scored the nightstands at World Market. You can check them out here. They were on sale + I had Christmas shopping money (thank you, Grandma!) + I have a designer discount… long story short – I got a good deal. When I bought the nightstands, they had matte black hardware on all the little catalog drawers, so I took those off and sprayed them using metallic chrome spray paint. It completely transformed their look, and made them fit the relaxing feel of our bedroom much better. Even our existing blue dresser from Simple Redesign got a little sprucing up – I removed the black hardware and sprayed them chrome to match the nightstands. The dresser is painted Benjamin Moore Hale Navy. BED: The bed frame was purchased on craigslist shortly after we got married for $100. It was wood. And Ugly. And Orange. 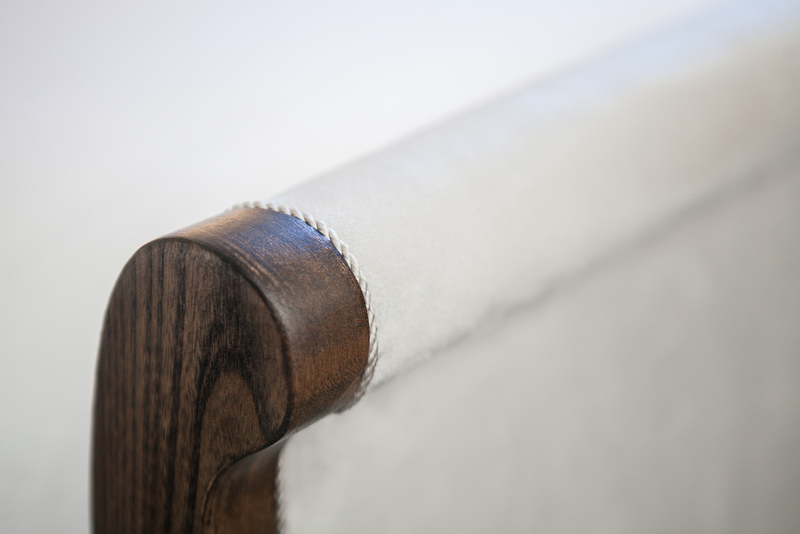 Check out how we transformed it into a luxurious upholstered bed. 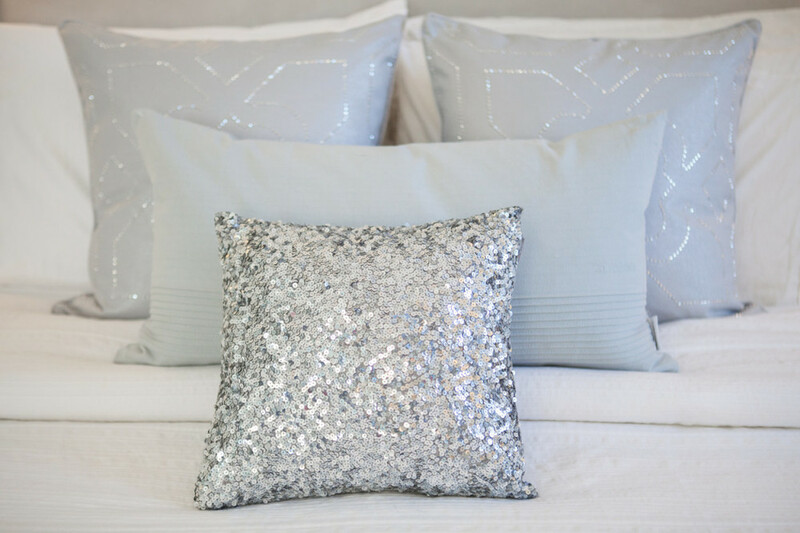 ACCESSORIES: The most exciting day of renovating our master suite was the day I went to Homegoods with a short list – mirror, bench, pillows. Man, I love Homegoods, but it’s one of those places that’s totally hit and miss. I see stuff there that I love all the time when I don’t need it, and then it feels like every time I’m looking for something specific, I can’t find it. This day, though, was different. It was PERFECT! I scored this mirrored, upholstered, amazeballs bench for $199 and this full-length framed mirror for only $50! On top of that, they must have just gotten in a huge stock of pillows and they were per-fect! I quickly filled up my cart with all my lovely finds while texting my husband pictures of my cart from the check out lane and just praying he would say, ‘Yes’. STEP STOOL: The little step stool is so our Bijoux dog can get up on our bed. More about how it’s currently on its third life here. ARTWORK: Justin and I painted that 30”x40” canvas over our bed on Valentine’s Day. It was a really fun exercise to do together, and neither one of us had any painting experience or training! If you mess up, you paint over it. It’s pretty much fool proof – and so fun! Check out some process pictures while we were painting it here. 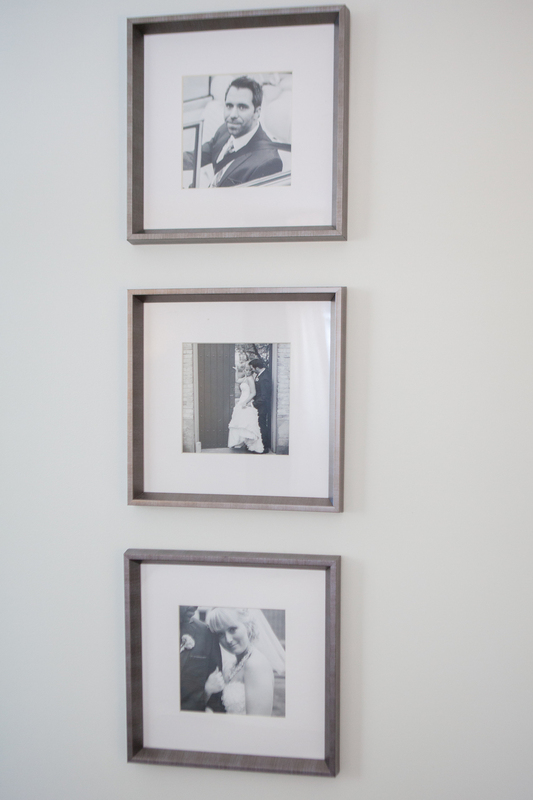 And here’s some little details around the room that pull the whole space together. I especially love our engagement and wedding photos from Bradley James Photography, the glass lamp Justin bought me for my birthday when we first started dating, and the dried hydrangeas from our wedding! We’re so in love with how this room came together! It’s our sophisticated, serene retreat at the end of the day. Older PostBuilding a Wood Paneled Wall - You Can Do It Too!